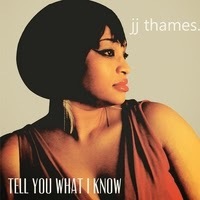 I just received the newest release, Tell You What I Know, from JJ Thames and it's excellent. The opener is Souled Out, a rich mixture of soul and spiritual with Thames rich lead vocals backed by warm harmonic backing vocals on a gospel rhythm. Hey You walks the line between soul and blues again with rich spiritual backing. Thames has a super voice and Celeb Armstrong adds a guitar vamp reinforcing the blues root. I Got What You Need has a super R&B sound with Grady Champion on harp and rich horns by Richard Beverly (trumpet), Todd Bobo (sax)and Mike Weidick (trombone).Thames has a powerful instrument in her voice and she uses it amply. My Kinda Man has a real slinky feel and soft neo soul delivery. I really like this track. It just has that "right groove". Thames sings with strong convicted emotion making this song particularly powerful. No Turning Back has a bluesy feel with that R&B step. Sam Brady carries a lot of the support on keys and Vince Barranco is solid on drums. Eddie Cotton lays down some stinging guitar work to top this track off! Can You Let Someone Else Be Strong is a soulful ballad which is nicely arranged and executed. I'Ma Make It is a high stepping R&B track with saucy attitude. Champion adds clever harp riffs adding spice here and there. On Ray Charles' I Believe, the horn section is used as crisp punctuation to sophistocated blues number with really nice key work from Brady. The vocals are always top notch on this release and Thames controls the temptation to grand stand as is so popular these days. Very nice. Just Enough has an Al Green feel with bassisit David Hyde really leading the way. (really nice David). This track really hits a strong groove and with the inclusion of a tasty guitar solo by Danny Scallions may be one of my favorites on the release. Wrapping the release is title track, Tell You What I Know, soul delivered Philly style. I really have a soft spot for the Philly soul and I love this track. Thames steps up like she has it in her blood and with her gripping lead vocals and well balanced backing vocals leaves you wanting much more. Excellent! If you have an inkling toward soul or neo soul music with a light blues twist, this is really a release that you should check!